As a school student, ‘Gbenga Sesan was denied access to the computer room at his Nigerian school and told he was not clever enough to operate one. From stand up-comedian Basketmouth to Nollywood star turned politician Kate Henshaw, from ICT expert ‘Gbenga Sesan to fashion designer Deola Sagoe, from football coach Femi Bamigboye to female mechanic Sandra Aguebor, each film focuses on one central character, who invites us into their world, sharing their story in their own words. “The series was commissioned specifically to support Al Jazeera English’s brand ‘Hear the human story,’ to bring people’s stories directly to our screens, told in in a first-person style without mediation, offering a range of authentic views,” says Ingrid Falck, head of documentaries at Al Jazeera English. Award-winning South Africans directors Brian Tilley and Clifford Bestall shot the series across Nigeria, which is home to one in five Africans. As a school student, ‘Gbenga Sesan was denied access to the computer room at his Nigerian school and told he was not clever enough to operate one. Years later, Gbenga is an Information and Communications Technology (ICT) expert, with international awards and a successful consultancy business. 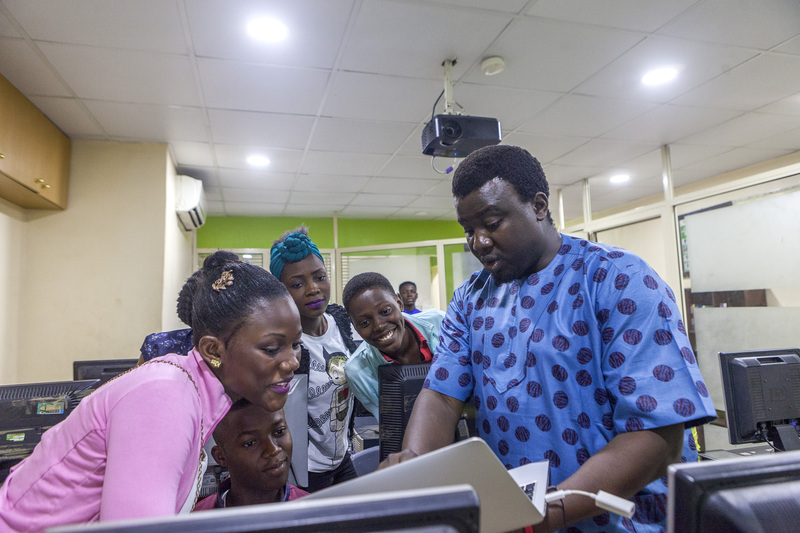 He’s spreading his good fortune by teaching ICT and life-skills to young adults in Nigeria’s poorest neighbourhoods. 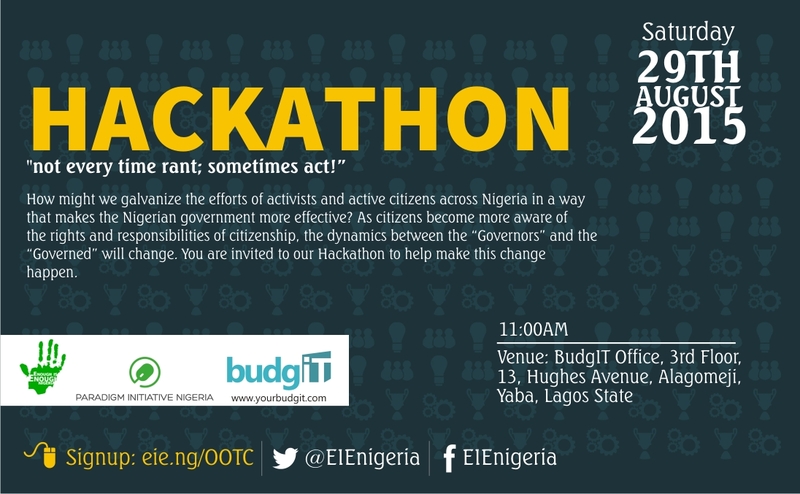 Hacking for Good: The Office of the Citizen Hackathon! Participants – both software developers and designers – will work to to build a platform where active citizens meet and provide solutions to key trending issues in the country. This platform will also connect citizens with civil society organizations to solve challenges of mutual interest. The ultimate goal is to nurture active citizens who understand their rights and responsibilities and choose to be actively engaged in the governance process to drive socio-economic development. The Office of the citizen will be a portal that brings active citizens together to brainstorm on ways to help the government with solutions on key issues. According to Mrs Oby Ezekwesili, governments are mere agencies of the people and the citizens need to be made an integral part of the decisions they make. The platform is expected to provide data that will be used to generate an annual ‘State of the Nation’ report that documents issues of interest to citizens and actions taken. Developers and designers are invited to grow their technology skills, experience community synergy and network with other developers. All skill levels are welcomed and even cheerleaders and supporters can attend. The first prize winner will walk away with N100,000 and there will be gifts for all participants including refreshments. The hackathon is free but participants & organizations must register to attend. Sign up at http://eie.ng/ootc/. The event will take place at the BudgIT office, 13,Hughes Street, Alagomeji, Yaba from 11 am. Technology and business support services are invited to support this initiative. For more information please contact Gbenga Aluko on 0708 778 4788. The event is supported by AIT Infotech Network, Tech Cabal, Google & Microsoft. Enough is Enough Nigeria (EiE Nigeria) is a coalition of individuals committed to instituting a culture of good governance and public accountability in Nigeria through active citizenship. EiE Nigeria created the RSVP (Register| Select | Vote | Protect) Campaign to leverage technology, especially social media to mobilize significant participation from citizens in the 18-35 age bloc in electoral process. Partners include The Future Project, Paradigm Initiative Nigeria (PIN), Education as a Vaccine (EVA), Kudirat Initiative for Democracy (KIND), LYNX Nigeria, Budgit, RISE Networks, Chocolate City Group, Empire Mates Entertainment (EME), Youth Initiative for Advocacy Growth & Advancement (YIAGA) and Public and Private Development Centre (PPDC). BudgIT’s innovation within the public circles comes with a creative use of government data by either presenting them in simple tweets, interactive format or infographic displays. We believe that in a democracy, every citizen has the right to know how his/her taxes are expended in the delivery of public infrastructure and services. Equality and open access to governance is entrenched in democracy and its institutions and as such, budgetary information as a vital asset needs to be understandable and accessible to all Nigerians. Paradigm Initiative Nigeria (PIN) is a social enterprise that connects Nigerian youth with ICT-enabled opportunities. Having worked with government, civil society, private institutions and international organizations, PIN’s projects build on years of combined experience and focus on socio-economic development. Our projects include Capacity Building programs such as L.I.F.E. and TENT; ICT Policy intervention programs and the #DigitalJobs campaign. PIN has written a 2-page letter to Nigeria’s President Buhari to protest the violation of human rights of private citizens as well as abuse of power by some Governors in Nigeria. The letter is based on earlier work on the subject of Internet Freedom by PIN, and follows an investigative report published by Premium Times, where incumbent Governor Dickson of Bayelsa State , ex-Governor Amaechi (Rivers State), ex-Governor Akpabio (Akwa Ibom State) who is also the current Minority leader in the Nigeria’s Senate, and ex-Governor Uduaghan (Delta State) were said to have engaged in illegal surveillance and hacking activities which involves them breaking into target computers and phones to monitor citizen’s private and confidential conversations on communication devices. The letter was to demand that President Buhari use his good office to protect the rights of citizens by Investigating and bringing to Justice every one found culpable in these illegal activities. Copied in the said letter were; the Vice President, Senate President, Speaker house of representative, Chief Justice of the Federation, Permanent Secretary Federal Ministry of Justice, National Security Adviser, National Human Rights Commission, Femi Falana Chambers, Nigeria Bar Association, United Nations Human Rights Commission, Freedom House International, Department of State Security Services, United Nations Secretary General, and Amnesty International. According to the Premium Times report which quoted sources from the National Security Adviser’s office and some of the governments under investigation, the illegal practice of intercepted calls and hacked phones and computers gave these public servants backdoor access to many people’s private lives, at the expense of taxpayers they swore to serve. Right to privacy is a constitutionally guaranteed right of every Nigerian citizen. As part of Paradigm Initiative Nigeria’s Internet Freedom Advocacy efforts, PIN raised an alarm when it was reported in the media that the Nigerian government under president Goodluck Jonathan invested massively in surveillance equipment as reflected in 2013 and 2014 National Budget. PIN published two Policy Briefs on May 29, 2013 and November 29, 2013, to identify the underlying issues and raise public awareness on the implications of these activities. In addition to this, a Freedom of Information request was made to demand contract details of purchased surveillance equipment as listed in the country’s national budget for 2013 and 2014. The request was denied, following which PIN approached the Court in order to pursue justice. The constitution is the supreme law in Nigeria and it does provide for freedom of speech, association, rights to privacy, etc. of every citizen. National Security has become a ready excuse for Government to acquire sophisticated technology with capability to monitor and spy private citizens’ online activities or conversations such as email, phone calls and all forms of text/chat messages. The concerns of abuse PIN has consistently raised has once again been confirmed by the Premium times report. PIN has been unequivocal in her demand for protection of online rights of citizens even in the face of security challenges Nigeria currently faces. PIN’s position is that any form of interception, even those for the purpose of security, requires judicial oversight and legislative processes must come first. PIN is currently leading an effort with the NetRightsNG coalition for Nigeria’s Digital Rights and Freedom law to ensure that Citizens right as established in the 1999 constitution of Nigeria are guaranteed online. #UpdatesFromPIN: We are excited about #DakataLIFE, Kano! 83 applicants picked up forms for the third session of training in 2015. 40 of the applicants were selected to be part of the #AjegunleLIFE 2015c training program after 3 days of rigorous interviews. Out of the 88 applicants’ who picked the L.I.F.E. training program forms in Aba, only 70 successful applicants were selected to be part of the #AbaLIFE 2015c training program. PIN Executive Director, ‘Gbenga Sesan was at the Aba Innovation Centre (ABIC) for the parents’ and students’ orientation exercise on July 29th, 2015. AbaLIFE Volunteers Appreciation event also held same day with the Executive Director. The L.I.F.E 2015c training program will run from Monday 3rd August – Friday 18th September 2015. Following intensive baseline studies across seven (7) North – Western state of Nigeria, Kano state was recommended to host the training. LIFE training program is expanding to Dakata Kawaji, Kano state, and training will commence October 12, 2015. We are excited about #DakataLIFE! PIN continued to conduct training for people in order to complete jobs and earn online. A special Elance class with Femi Bayode was organized to help the trainees understand how to develop great online profiles Which can greatly improve their chances of securing jobs from prospective clients. 18 people attended the Customer Service Skills training while 30 people attended the Writing and Translation Skills. The #DigitalJobs team was present at the Tech + 2015 event that held at Eko Hotels and Suites from 24th -25th July 2015 to introduce participants to the concept of online work. Questions were answered and participants were given flyers and stickers for more information about online work. A total of 183 people visited the #DigitalJobs stand, and also subscribed to get updates on the project. PIN introduced the ‘#Elance1000 give-away;’ a platform that encouraging young people to sign up and also sign up others for online work. on bit.ly/elancedja. PIN will give out N1,000 to every individual that introduces 5 people newly to #DigitalJobs. The July #DigitalJobs contest featured all those who have been working on Elance from November 2014 till date. Detailed stories of each participant’s journey on online work and the number of jobs completed were submitted, and winners were selected. Out of 6 stories submitted, Oluwaseun Malomo, Elijah Otor, and Gbenga Adebiyi emerged in the first three places respectively. They were rewarded with a brand new laptop, Samsung galaxy tab and Microsoft Lumia respectively. PIN’s Executive Director ‘Gbenga Sesan and the ICT Policy Manager, Adegoke Adeboye were at the Public Inquiry event on The Draft Lawful Interception of Communications Regulations organized by the Nigeria Communication Commission (NCC) in Abuja on Tuesday 7th July, 2015. The ICT Policy office was also represented at the 2015 edition of The Nigeria Internet Governance Forum (NIGF). The Theme of the forum was “Harnessing the Potentials of Internet Governance for Sustainable Development in Nigeria”, and it was preceded by a Youth Workshop which was themed “Internet of Everything & Your Business Opportunity”. PIN’s Executive Director, ‘Gbenga Sesan made a presentation at the plenary on Internet and Human Rights, where he highlighted the importance of the online rights of citizens against the backdrop of policies/laws that are being considered in order to address security/terrorism concerns. Adeboye Adegoke also joined PIN within the month as ICT Policy Manager. OAU students on the TENT@School are nearing the final lap in their academic courses. As part of PIN’s commitment to secure them internship opportunities in line with their technology projects, many of them are currently going through the interview process with the organizations of their choice. The internship kicks off in October 2015. PIN is committed to facilitating internship placements for 13 OAU students who have been working on TENT@School since their first year in school. PIN in conjunction with Codify Naija has kicked off a Code Camp in Kano State. The Code Camp will run for a period of 3 weeks beginning from July 27th with a focus on teaching bright secondary school students programming languages and how to code. Out of the 32 students who registered to participate, only 22 were qualified and 16 are currently undergoing training at Code Camp. The expected end date for the Code Camp is August 14th, 2015. The second TENT Workshop for the year will hold at University of Uyo (UNIUYO) from Thursday 14th – Friday 15th August 2015. Speakers are Editi Effiong, CEO- Anakle; Aniedi Udo-Obong- General Country Manager at Afrocabs and PIN Executive Director, ‘Gbenga Sesan. As citizens become more aware of the rights and responsibilities of citizenship, the dynamics between the “Governors” and the “Governed” will change. Our power is in our collective, amplified voices.